I have fond memories of growing up in Australia and driving with dad to the local fish and chip shop to pick up a delicious parcel of fresh fish wrapped in newspaper. On the way home, the irresistible smell of fresh fish and chicken salt filled the car, which made the usual short journey often a painful one. Other times, our family used to drive down to the beach and eat fish and chips on a picnic rug by the beach, listening to the waves settle upon the shore and fending off dozens of greedy seagulls. When I heard about the latest opening of The Fish & Chip Shop in the heart of Islington I wasn’t entirely convinced. 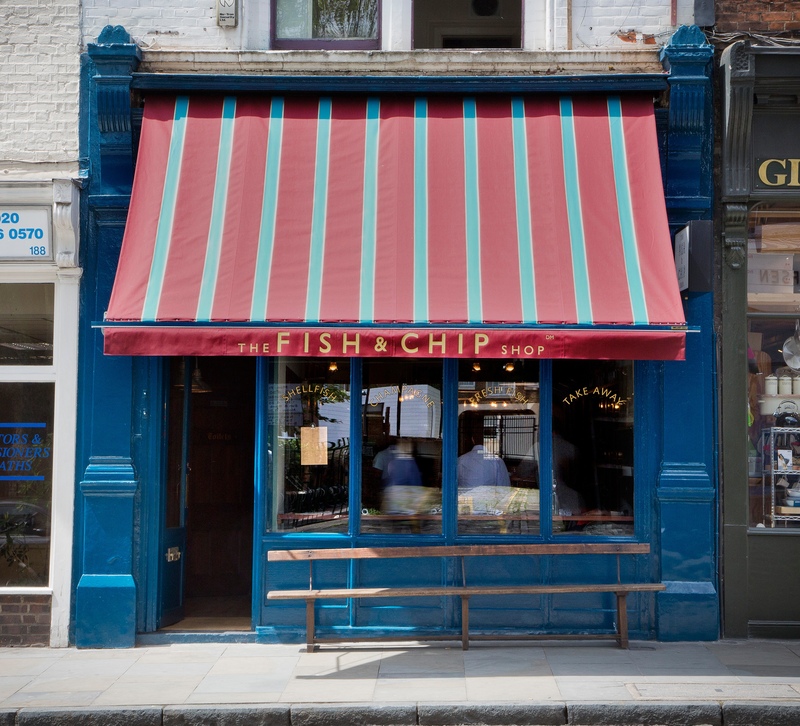 For me, fish and chip shops should be of the ‘rough and ready’ variety, not posh establishments on high streets. But apparently this isn’t your average fish and chippery. Every morning, fresh and sustainable fish is delivered to the kitchen from Brixham in south Devon from origins approved by the Marine Stewardship Council. For a wintry London weeknight the venue was packed and buzzing. There’s no mistaking its authentic, seaside feel with its salvaged timber, tiled walls, antique mirrored frames and drop down lamps. After a couple of wines you may trick your mind into thinking you are at an old english fishing village by the seaside. And with brilliant retro tracks from the 50’s and 60’s such as Sam Cooke’s Twistin the Night Away’ you couldn’t help be in good spirits. We perched on the high stools in front of the fishmonger’s table right in the centre of the action. 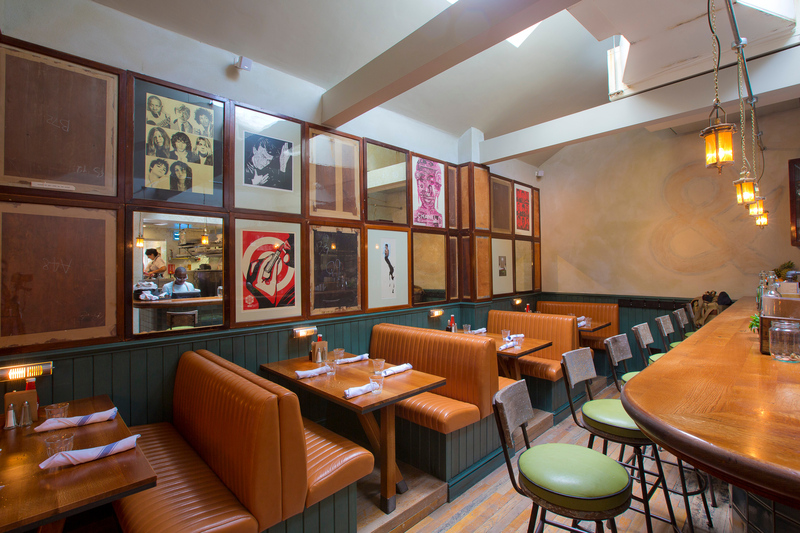 The restaurant is small, with only 60 covers, so expect to get a bit up close and personal with your neighbour unless you’re lucky enough to nab one of the vintage leather banquettes. The menu is presented on retro brown paper and has a good selection of haddock, pollock, cod and plaice. But the menu doesn’t stop there. For the more refined tastes, you can also sample Dorset rock oysters and scallops and the famous fish pie. For a touch of nostalgia, there’s also a signature ‘Butties’ menu which includes old school favourites like fish fingers and pea puree. I ordered the cod (£9.75) served in the Fish & Chip Shop’s own recipe batter, made with local Camden Hells beer. 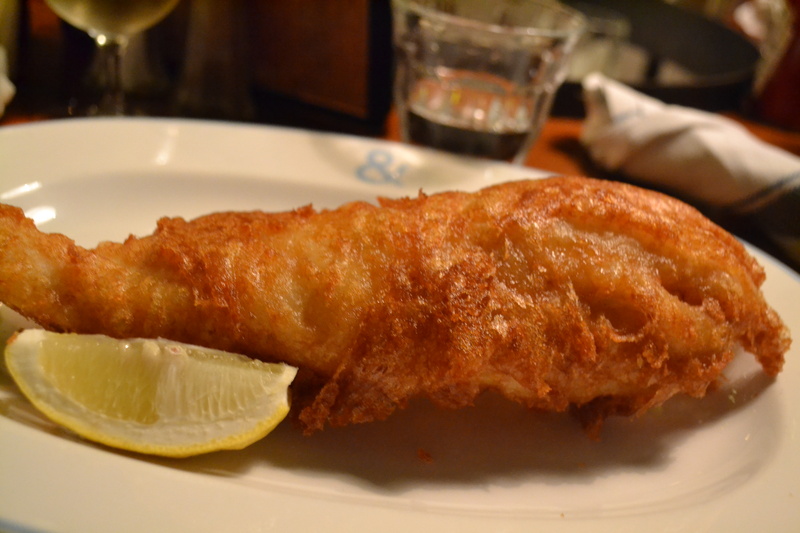 The cod was encrusted with a beautiful golden layer of beer laden batter. It definitely passed the crunch test but wasn’t too thick or greasy like some batters can be. 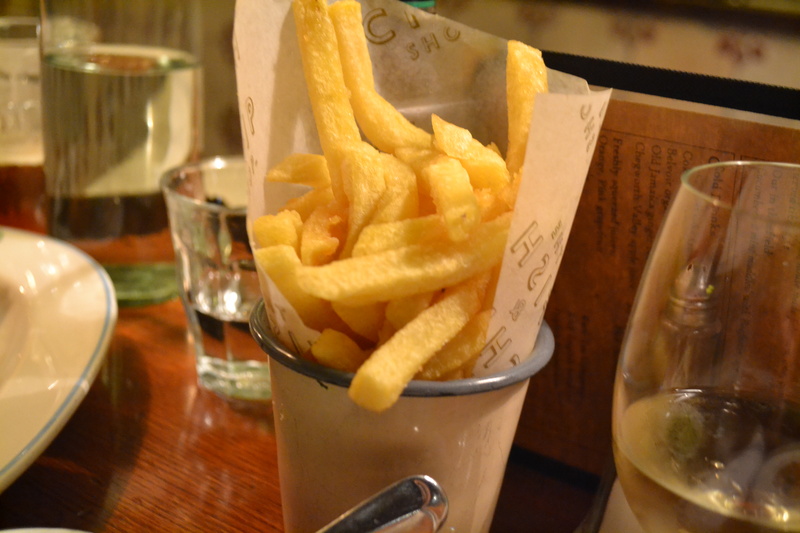 The hand cut chips (£3) were double cooked in refined rapeseed oil which gave them a really nice crunch and texture. They were not in the league of Heston Blumenthal’s triple cooked chips, nor did they have the heavy sprinkling of chicken salt which I love so much in Australia, but they were tasty. 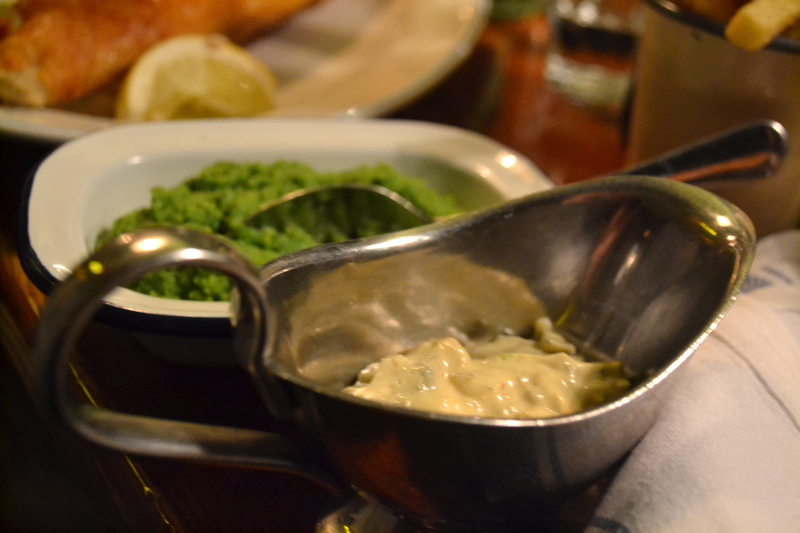 Not to be mistaken with mushy peas, the crushed peas (£3) were fresh and had a lovely mint infused flavour. You can also help yourself to a lovely basket of condiments including vinegar, spicy tartar, curry and chilli. For the sweet tooth, there is also a nice selection of puddings on the menu. For me, puddings and fish and chips don’t feel right together so I resisted the temptation. Would I trade posh fish and chips with a rough and ready takeaway on the beach? No. 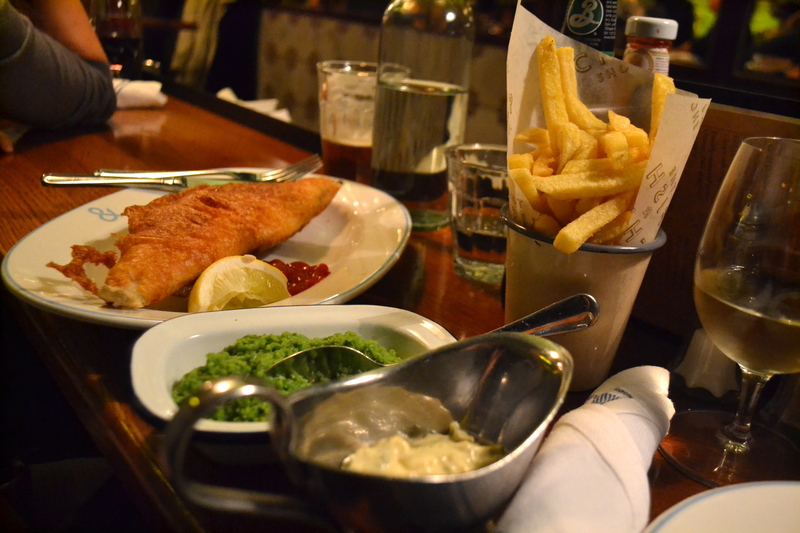 But as far as battered fish and chips go, it’s nearly as good as London gets. Under £40 for two fish and chips. including sides, wine and service. This looks so good… it is one of the things we miss from Australia. Italy doesn’t do fish & chips. Mmmm, I am a huge sucker for good fish and chips! This place looks so cute, kind of bit more upscale than your typical fish and chip joint. It looks good, but I’m always sceptical that you can beat chip shop mushy peas! OM NOM NOM, and in my neck of the woods, too!